This week is the final week of the world's most popular sport: Football, (or Soccer in North America). Since June 12th, 2010, the world has been captivated by exciting games played by the world’s best soccer players. Nationalism is feverishly high. Expectations of the soccer superstars are also soaring. Superbly hosted by South Africa, the once-in-four-years soccer tournament attracts more than a billion viewers worldwide. In fact, the cumulative total viewership ranges in the region of billions. That is a figure that should make any advertiser sit up and pay attention. During my travels to Singapore, Malaysia and Taiwan last month, I managed to enjoy the soccer mania going on there. The fanaticism over soccer in Asia can be likened to Ice Hockey in Canada, or American Football in America, or Cricket in Pakistan. As I sat at an open-air coffee shop one evening, I spoke to a soccer bookie, who was doing a brisk business taking bets. He told me that this year’s competition has caused many upsets. A lot of people lost money. Big money indeed! Even for Asia that does not have strong competitors, the interest is surprisingly astronomical. For countries represented, citizens express their nationalistic fervours openly. With stakes so high, losing is not an option. This week, I like to take a look at life’s lessons we can learn from the game of Soccer. One reason why soccer is such a fascinating sport is because it mirrors many lessons in life. The rules are simple. Rightfully or wrongfully, the referees on the pitch have the final say. I remember the Germany-England game, when England was trailing by a goal. Almost a minute later, Frank Lampard, an English striker shoots the ball at the German goal. The ball hits the top post and bounced INSIDE the goal line. According to the rule book about goals, when the ball crosses the line even if it does not touch the netting, it is considered a goal, only if the referee sees it. Unfortunately, the linesman fails to see the ball landing past the goal line. The referee has the final say: No Goal. TV commentators are baffled. Millions of viewers cannot believe the injustice. The ball is clearly in. As the English players remain stunned, the Germans go on to complete the rout to move on to the next round. England does what they could to try to equalize. Unfortunately, Germany is gifted with a bad refereeing decision. Pundits say that moment changes the pace of the game and cost England dearly. Indeed, the single biggest lesson to learn from soccer is that life is unfair, at least from the victim’s point of view. The players go by the rules, and do their best. They summon their best skills, the most competent teamwork to score a goal. Eventually, what they do has to be decided by the decisions made by the referees of the game. The referees have the final say, regardless of whether it was the right or wrong decision. FIFA, the official governing body of the sport stands firmly behind their referees. Any complaints about justice or injustice, fairness or unfairness are all futile. Referees have the final say. Not allowed to use video technology to check the goals, the referees have no choice but to deny England an equalizer that can potentially change the tone of the game. Life Lesson: Life is unfair, even after one has done all he can to ‘deserve’ the reward. Like the wise man in Ecclesiastes, one can work all he can, but the fruits will be reaped by others instead. The beneficiary for the referee’s mistake: Germany. 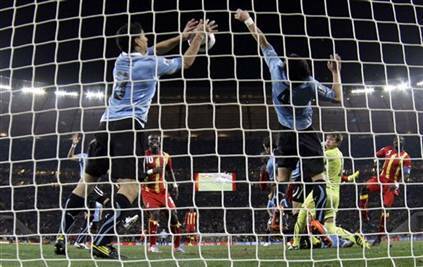 The Ghana-Uruguay game also ended with controversy. With the teams unable to break the deadlock, there was a last minute push by the brave Africans to win the game. A ball that was headed directly into the Uruguayan goal was then, in an unsporting manner, pushed away by a Uruguayan player with his hands. Ghana should have won. Unfortunately, the rules of the game say that the maximum punishment that referees can inflict on the offending player is a Red card. A legitimate goal was unfairly stopped by an illegitimate tactic. I would have more respect for Uruguay, had they concede the goal in a noble fashion. Unfortunately, anything is worth it, at least from Uruguay’s point of view. The player was sent off. The penalty was given. Unfortunately, it was the Africans who failed to take advantage of the penalty shots. When Ghana misses the shot, I have this sinking feeling that as far as Uruguay is concerned, it 'pays' to cheat with hands. Wouldn't it be fairer to simply award Ghana the winning goal? Life Lesson: Even when we play by the rules, the outcome may still be unfair. The best team does not always win. Like Qoheleth in Ecclesiastes, the outcome is unfortunately not what he plans for. The beneficiary for sticking with the FIFA rules: Uruguay. Anyone watching a soccer game will be peeved by some of the bad calls made by referees. Having said that, there are also cases of cheating when players deceive referees by faking an injury, acting out by diving inside the penalty box, or to gesture in an unsporting manner. In the soccer pitch, acts of deception are common in a game of high stakes. When the referee awards a free-kick, or a penalty due to such ‘acting,’ where is justice? Where is fairness? In the game of life, there will be some winners and many losers. With 32 teams vying for the coveted trophy, there can only be one winner and 31 other non-winners. Life Lesson: Referees are not perfect. So why are we so ready to place expectations that seem to elevate them to perfected beings? As we live, we will only frustrate ourselves when we expect perfection all the time from others and from ourselves. While I am not condoning mediocrity, I am asking for us to exercise godly patience and grace to one another. The beneficiary for the referee’s bad calls: The opponent. Whether we blame it on the system, the rules, the referees, the players, the coaches, the pitch, the weather or even the poor ball, all are part of the imperfect world we live in. It is into this imperfect world that Jesus comes into. It is through an imperfect family that Jesus was born into. It is along the imperfect religious and political constraints that Jesus walks and navigates through. Alas! The world’s most unjust event caused Jesus his life. As mortal man, we tend to complain when things do not work out according to our ways. What about Jesus? He obediently went to the cross, despising the shame, was crucified, died and was buried and is not seated at the right hand of the throne of God. In doing so, he offers all who chooses to believe and trust Him the gift of eternal life. It is a paradigm shift. The greatest benefit that we have all received comes not out of our own hard work. It comes in the form of a gift, the gift of grace. When I read Ecclesiastes treatise on the unfairness of life, I cannot but feel a sense of shame and injustice. However, when I read it TOGETHER with the gospel, I marvel at how Jesus comes not to destroy but to fulfill the law. Whatever unfairness we seem to get, whatever injustice Jesus has suffered, it is comforting to realize that in Christ, Jesus has given us a blank check with one name as the beneficiary: Ours. The beneficiary for the mistakes of the world redeemed in Christ: US! At least in Ecclesiastes, there is a redeeming aspect toward the end of the book. Qoheleth is correct to identify the futility of life. However, that alone is incomplete. While Soccer can teach us about how unfair life can be, there is one lesson that soccer cannot teach us: The gift of life eternal in Christ. Surprise! Surprise! In Christ, the ones who have not really worked for the rewards are none other than ourselves. [I am talking about salvation, the gift of eternal life] The soccer ball is round as if it is bounded by the imperfect rules of the world. Salvation on the other hand, is whole because it is unbounded through the sacrificial love of Jesus.